The Toyo Kogyo Co. of Hiroshima, Japan, the predecessor of Mazda Motor Corporation, built its first vehicle, the Mazda-Go three-wheeled truck, in 1931. All of the company's trucks were given the Mazda name, partly in reference to Ahura-Mazda, the Zoroastrian god of light, and partly because it sounded like the name of company founder, Jujiro Matsuda. The first Mazda passenger car, the R360 coupe, was released in 1960. In 1961, Mazda started technical cooperation with NSU of Germany for rights to develop and use the powerful, lightweight rotary combustion engine originally designed by Dr. Felix Wankel. Mazda started selling rotary-engined cars in Japan in 1967, the same year it began exporting cars to Europe. Mazda entered the U.S. market in 1970 with the rotary-powered RX-2, and introduced the slightly larger RX-3 in 1971. Their ability to leave behind cars powered by larger conventional engines made a big impression. In 1978, Mazda introduced the RX-7 sports car, powered by a twin-rotor Wankel engine, and its combination of power and handling made it an instant hit. The Mazda 787B prototype, powered by a four-rotor, 700 horsepower engine, won at Le Mans in 1991. Current models include an updated version of MX-5/Miata sports car, the Axela/Mazda 3 and Atenza/Mazda 6, and the latest Mazda rotary-powered sports car, the RX-8. As the nemesis to the Nissan Skyline – the RX-3 battled and defeated the mighty Skyline in the 1972 Japanese Grand Prix, denying Nissan 50 consecutive wins – the RX-3 represents the sportier side of Mazda when compared to the more docile RX-2. 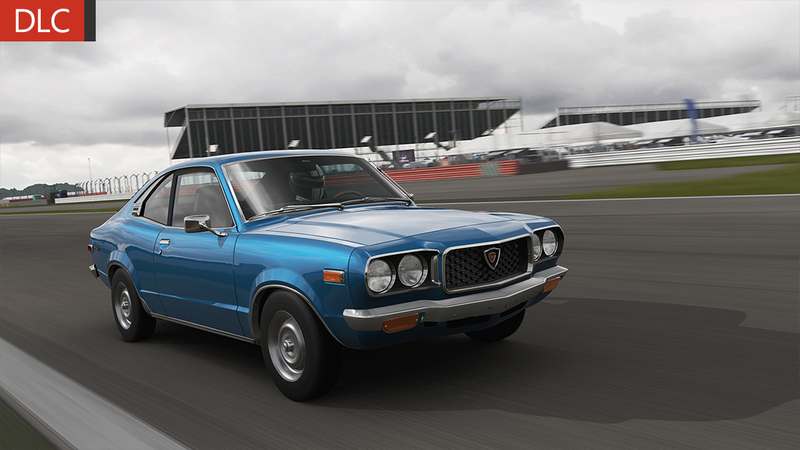 Outside Japan, the Mazda RX-3 was competitive on the track, dominating the Class C entries at the Bathurst 1000 and in the U.S. in IMSA and SCCA racing. Under the hood is the twin-rotor 12A, creating more than 100 high-revving horsepower. Even though not as fuel-efficient as some of the other compacts from Japan, the RX-3 was extremely popular, making up more than fifty percent of Mazda’s sales before the release of the RX-7. While the RX-7 was a pure sports car, the RX-3 contributed much to its design. These days seeing an RX-3 is a rarity and will raise the dander of any true classic import lover. 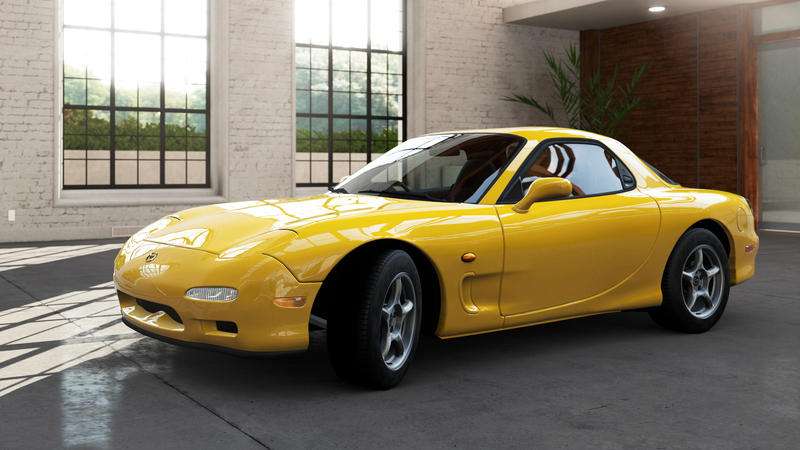 There are so many reasons to appreciate the Mazda RX-7; if not for its performance-per-dollar value, then for its innovative design. The Wankel-powered RX-7 is the only vehicle to utilize the awesome, unlimited rev-ability of the rotary engine. 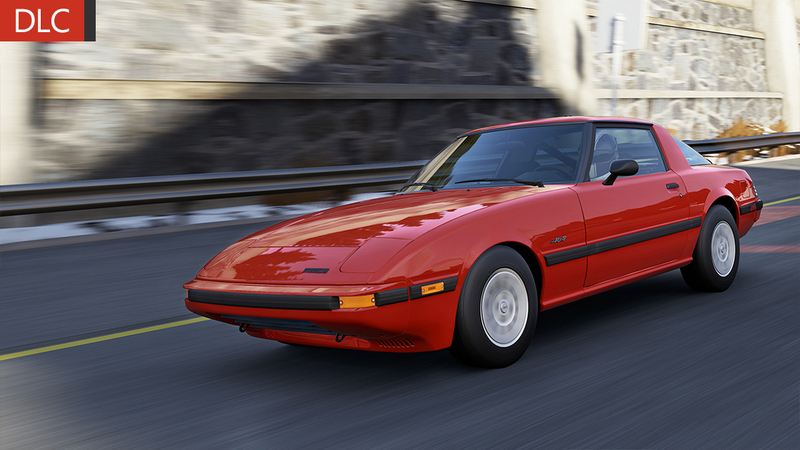 The ’85 GSL-SE introduced the 13B engine, the largest, most powerful RX-7 rotary motors to be developed at the time. The car also received bigger brakes and stiffer springs and shocks. Because the motor was situated behind the front axle it was referred to as front-mid engine and the result was a perfect 50/50 weight distribution. Altogether, the car weighed barely 2,500 pounds and, with its live-axle rear end, turned a .77 on the skid pad. Combined, these factors produce a formidable sports car. They are a rip to drive and one of the most affordable sports cars around. Tune one up in Forza and watch it blow away more powerful cars. A "banshee rotary". The sound of "seven thousand cats being stung by seven thousand wasps." These are just two of the more colorful descriptions from journalists about the 1991 Mazda #55 Team Mazdaspeed 787B’s inimitable 690-horsepower Wankel-type rotary engine. That motor and it’s unmistakable, gloriously chaotic noise is coming to bring a full aural and automotive assault to every track in Forza Motorsport 4. Of course, if you’re a traditionalist, you’ll first want to hit Le Mans and, in particular, the Mulsanne Straight, where the 787B is most at home. The 787B and its Group C brethren regularly hit speeds north of 215 mph, which eventually caused the Le Mans organizers to add chicanes in 1990. 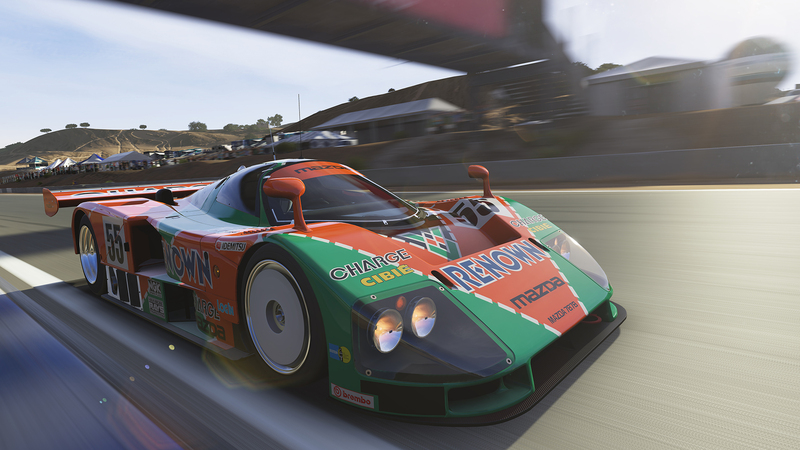 And in 1991, the 787B won Le Mans itself, only for Mazda to find its star car banned after a rules change banned Wankel-type rotaries from competition. The 787B now sits in a place of honor at Mazda’s Hiroshima museum and for good reason: Since the team’s victory twenty years ago, no other Japanese manufacturer has managed to win Le Mans, a fitting legacy for a car that needs to be seen, driven, and heard to be believed. Cars can’t have biological parents, but it’s safe to say that Bob Hall is as close to being the father of the Mazda MX-5 Miata as a person can get. As an employee of Mazda’s American R&D department, Hall virtually single-handedly promoted the idea of a classically British sportscar to the Japanese company, appealing to their history of producing excellent sportscars. With the help of several sympathetic employees both stateside and in Japan, Hall got his wish, and Mazda approved production of the kind of car Hall wanted—a rear-drive, two-seat convertible with a peppy conventional inline piston engine (rather than the Wankel rotary that Mazda used in its higher-end RX-7). Devoid of the heavy gadgetry and gimmicks of sportscars of the time, the Miata debuted as an instant hit, and has gone on to be far and above the highest selling two-seat convertible ever produced. By 1994, the Miata received several upgrades, including better chassis bracing, an available limited-slip differential, and a new 1.8-liter DOHC engine. What didn’t change is the Mazda’s fun-to-drive factor, which recalls the classic roadster while providing a modern driving experience. 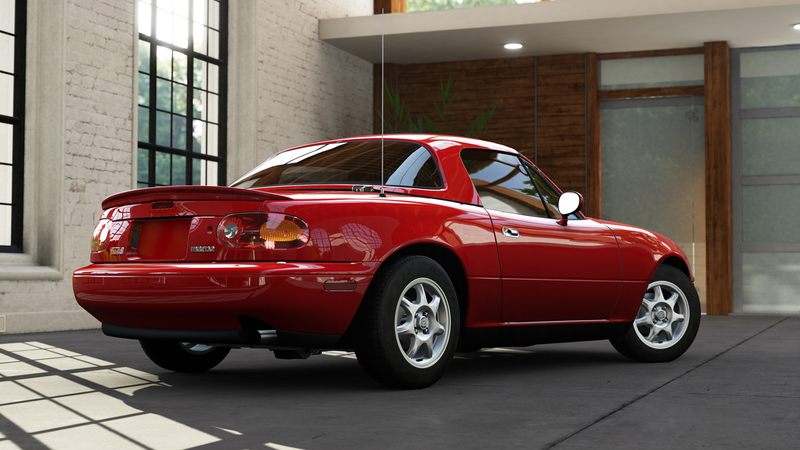 The MX-5 Miata is also the foundation of a popular one-make series, Spec Miata, and a quick drive in the tiny but nimble Mazda will make it clear why it’s a favorite of drivers everywhere. Small, low, and very fast, the third-generation RX-7 is light-years away from its distant ancestor, the Mazda Cosmo of the 1960s. Mazda is well-known as the only company left still developing the Wankel rotary engine, and while the Renesis engine in the RX-8 represents the latest evolution of the concept, the FD-generation RX-7 represents the ultimate street performance variation. The high-output 1.3-liter 13B-REW under the sculpted hood is the first mass-produced sequential twin-turbo design, co-developed with turbo manufacturer Hitachi. The first turbo, active from 1,800 to 4,000 RPMs, produces 10 PSI of boost, but after that the second, larger turbo provides an additional 10 PSI—resulting in 261 smooth-as-silk horsepower and staggering performance. The 13B series of engines is essentially modular, and stacking four rotor housings together produced the powerplant of the 787B, the only Japanese car to ever win outright at Le Mans. How’s that for performance heritage? For 2010, the much-loved Mazdaspeed 3 both changes and stays the same. What’s different is the revised sheetmetal that brings a distinctive trapezoidal grille to the entire Mazda 3 range as part of the new “Nagare” design language—although in the Mazdaspeed version, the 3 gains a large hoodscoop to keep the intercooler cool. 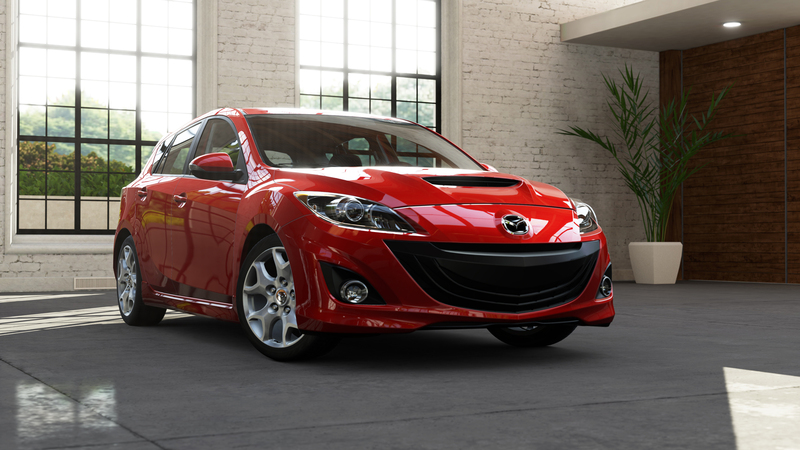 As you would expect, the Mazdaspeed 3 comes with stiffer suspension than the normal version, as well as a new torque management system to deal with the twist produced by the 2.3-liter four cylinder that is turbocharged to the tune of 263 horsepower and 280 ft-lbs. of torque. The result is just a hint of torque-steer, although not nearly as much as there would be without the limited slip differential. Thanks to these technologies, the Mazdaspeed 3 is quick off the line, and pulls hard out of corners, almost as if it was equipped with all-wheel drive. It’s not; but for a front-driver with this much power on tap, the results are highly impressive. Also of note is the new boost gauge, an LED indicator vertically sandwiched between the tachometer and speedometer—just the kind of little sporting touch that Mazda is known for. 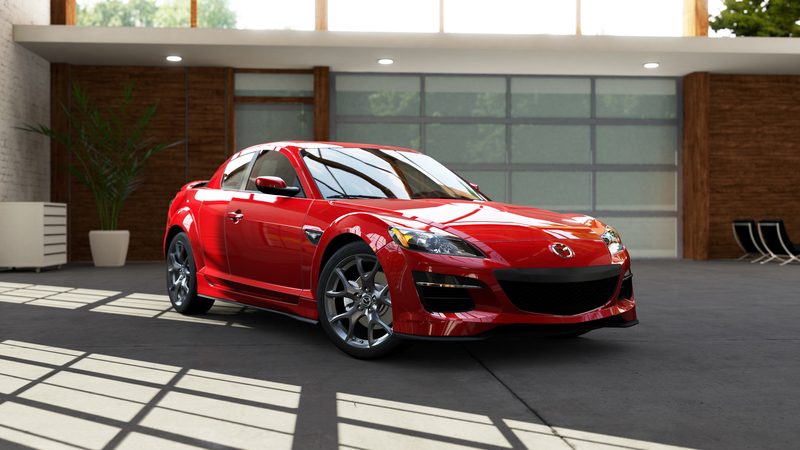 Though the 2011 Mazda RX-8 will be the last production model of the RX-8 series, it appears to be going out with a bang. The 1.3 liter engine is capable of 232 horsepower, a top speed north of 130 mph, and a 0-60 time of around seven seconds. The six-speed manual transmission and light weight make for a responsive ride and there’s no denying the pleasing whines of that rotary engine. It might be going away, soon to be replaced by Mazda’s next sports coupe, but you’ll be able to enjoy the RX-8’s swan song in Forza 5 for years to come. The Mazda MX-5 doesn’t have to be the most powerful roadster ever made to remain one of the best choices for spirited driving and all-out fun. It’s been almost a quarter of century since the Miata was introduced and other roadsters have come and gone while the Miata remains with very few changes overall. Fun can be found at any speed in a Miata and the handling will make any driver feel like they are one with their car. Steering is communicative and handling is intuitive. Power from the reliable 2.0 liter inline four-cylinder, while not immense at 167 HP, is ample to keep you stuck in your seat and grinning madly with an earful of its delicious exhaust note. As the saying goes: don’t fix it if it ain’t broken. Aside from a slight styling refresh, the MX-5 just keeps getting it right. 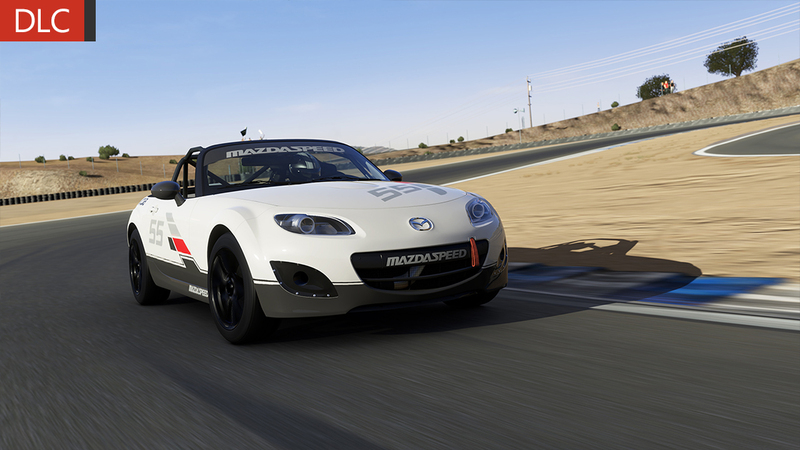 One of the most affordable ways to get into real-life racing is to prepare a Mazda MX-5 Cup car. Teams such as CJ Wilson Racing have helped drivers with aspirations to hit the track to live their dream of competing on the same courses as the Tudor United SportCar Championship and other professional series. Many drivers graduate from the MX-5 Spec series to launch racing careers. 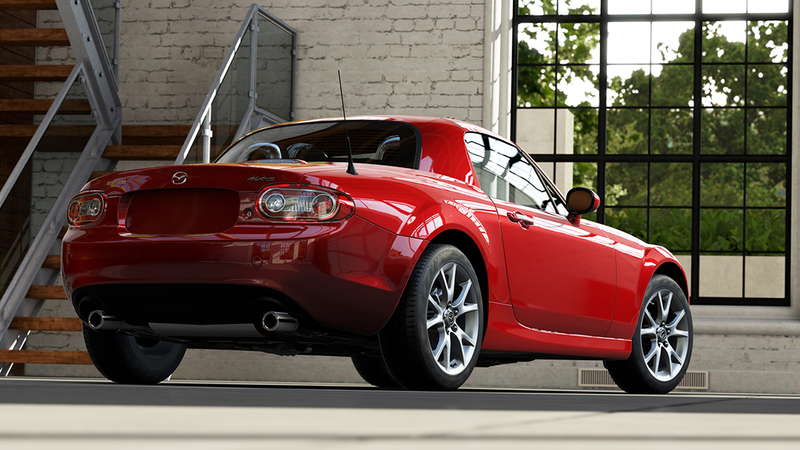 In the MX-5 you have the perfect lightweight and nimble package that anyone can learn to corner properly. You also have a healthy 190 horsepower up front pushing the rear wheels with top speeds somewhere around 120 mph. In the MX-5 Cup car you have a race-prepared car with adjustable suspension, improved braking, a stiffened chassis, and reliability that lets you focus on reeling in the car ahead of you. Looking to follow the Mazda Road to Indy? A USF2000 is a formative step toward Indy Lights and possibly even a true IndyCar racing career. Greats like Dan Wheldon and Sam Hornish Jr. stepped on this rung of the open-wheel ladder, as well as rising stars like Sage Karam. 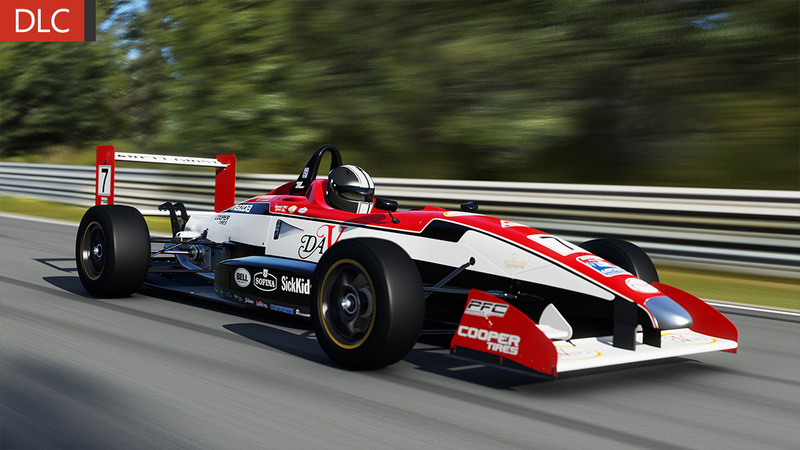 Driven currently in the Cooper Tires USF2000 Championship Powered by Mazda, cars like the Andretti Autosport USF2000 provides drivers as young as 14 with a chance to prove their worth as well as an opportunity to progress to the next level – Pro Mazda. These Van Diemen Elan chassis are open-wheel, single-seat, open-cockpit racers with front and rear wings. Multiple tuning adjustments make them competitive on any track. They are powered by Mazda MZR 2-liter powerplants with somewhere in the neighborhood of 170 horsepower connected to a Hewland 5-speed sequential gearbox. These cars can hit speeds of 150 mph. Consider it a contrast to the Formula Ford racers but, instead of touring with the BTCC cars of England, these teams follow and race on the same tracks as IndyCars.